Aan de Hogeschool voor de Kunsten Utrecht (HKU) studeren ruim 3800 studenten in de richtingen Beeldende Kunst, Vormgeving, Muziek, Theater, Games en Interactie, Media en Kunstmanagement. 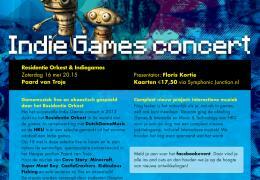 Control Magazine is het vakblad voor de Nederlandse Gamesindustrie. Greencouch is een collectief van 4 componisten en klankontwerpers dat muziek ontwerpt voor diverse media, waaronder films, games en installaties. Het GreenCouch collectief heeft als doel om jouw Media productie van gepaste muziek en geluid te voorzien. SonicPicnic was founded in 2002 by its four members. We compose and produce music, design sound and we deliver audio post production services for media. We're active in different playing fields like film, television and commercials but we have a special place in our hearts for games! "Soundgram Post" is the Audio and Music Post-Production company of composer and sounddesigner Johan van der Voet for original music scores, recordings, foley and sound design. Claynote (adaptive) music, consists of Jakko ter Borg and Rik Nieuwdorp, who have been working together since 2006, when they met in their final years at the Utrecht School of Arts (HKU). Mana Burn Music is a team that consists of two game composers and music producers that specializes itself in music and sound effects for games.